The diocese of Cloyne had its beginnings in the monastic settlement of St. Colman, son of Lenin, at Cloyne in east Cork. A round tower and pre-reformation cathedral (now Church of Ireland) still stand at the site. Oengus has a reference to Colmán of Cloyne for the 24th November. He describes him as “the son of Lenin the vehement”. It is said he was 9th in descent from the kings of Munster and that he was born in Cork. Colman trained for twelve years as a bard and became the Royal Bard of Munster at the court of King Aodh Caomh at Cashel. This would have made him historian, genealogist, geographer and chronicler to the Munster kings. Brendan (of Birr? / or Clonfert?) visited Cashel for the inauguration of the new king, Colman was so impressed by how Brendan conducted the service that he asked to be instructed in the rudiments of Christian faith. After initial instruction, Brendan baptised Colman and sent him to St Jarlath of Tuam for further formation and was ordained a priest. Colman’s principal foundation (560) was at Cloyne, Cluain Uamha, “Meadow of the Caves”, in east Cork, which Cairpre Crom, king of Munster, gave him as a site for a monastery and monastic school. The Danes plundered Cloyne in 822, 824 and 885. The diocese of Cloyne was named at the Synod of Kells in 1152. A cathedral and round tower in the village of Cloyne remains in the possession of the Church of Ireland. 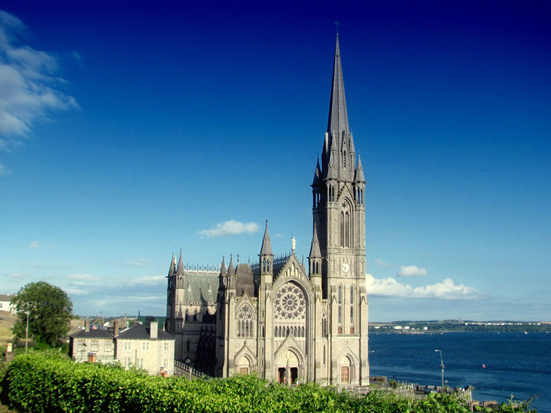 A Catholic cathedral of St Colman was built at Cobh, beginning in 1868 and completed in the early years of the 20th century. Another foundation associated with Colman was at Kilmaclenine, near Buttevant, in north Cork, which is said to have been his birth-place. His feast is observed on 24th November. Thaddeus MacCarthy was born in West Cork around 1455. He studied abroad, probably in Paris. After his ordination he went to Rome and was possibly working in the papal Curia when in 1482 at the age of 27 Pope Sixtus IV appointed him bishop of Ross. With a dispensation from the age impediment, he was consecrated by Archbishop Stephen of Antivari and two other bishops in the Church of Santo Stefano del Cacco, Rome. 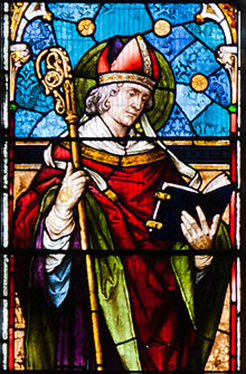 Thaddeus travelled to Ireland only to find to his surprise that Ross already had a bishop, Hugh O’Driscoll, appointed nine years earlier by the same Pope and consecrated by the Archbishop of Cashel. O’Driscoll took the position that Thaddeus’s claim was a political manoeuvre by the MacCarthy family against his own O’Driscoll family. There had been a long-standing feud between the two families. In 1483 Bishop O’Driscoll went to Rome to denounce Thaddeus and Pope Sixtus IV accepted the legitimacy of O’Driscoll’s appointment nine years earlier. He ordered MacCarthy to withdraw. Thaddeus was dissatisfied with the documentation when it arrived and continued to uphold his claim. The following year Pope Sixtus IV died and his successor Pope Innocent VIII upheld O’Driscoll’s claim, declaring that Thaddeus was not the bishop of Ross. Thaddeus now requested an independent enquiry to establish the facts. When this was complete, Innocent VIII declared O’Driscoll as legitimate bishop of Ross by prior appointment. However, some time later (1490) Innocent VIII appointed Thaddeus bishop of Cork & Cloyne, which had been united in 1429 and where the incumbent, Bishop William Roche, had voluntarily resigned in his favour. But when Thaddeus went to claim his diocese, he found the cathedral at Cork occupied by another claimant, Gerald Fitzgerald. Thaddeus set out to Rome again to have the issue finally sorted out. In a motu proprio dated 18th July 1492, Pope Innocent VIII clearly recognised him as the legitimate bishop of Cork & Cloyne. He set out on the return journey to Ireland on foot, travelling incognito along the pilgrims’ route. While passing through Ivrea not far from Turin, he passed the night in a pilgrims’ hospice. In the morning a brilliant light was seen shining from his room and, on investigation, it was found that Thaddeus had died during the night and the light, like flickering flames of a fire, shone from his body and the pallet where he lay. Opening his travel bag, they discovered his episcopal insignia and the papal documents. News spread, crowds gathered, and several sick persons were miraculously cured. The bishop of Ivrea directed his body to be brought to the Cathedral where it lay in state for several days and was laid to rest in the cathedral of Ivrea under the altar of St Eusebius, where it still bears the inscription: Cava S. Eusebii et sepulcrum B. Taddei Ep. Hib. 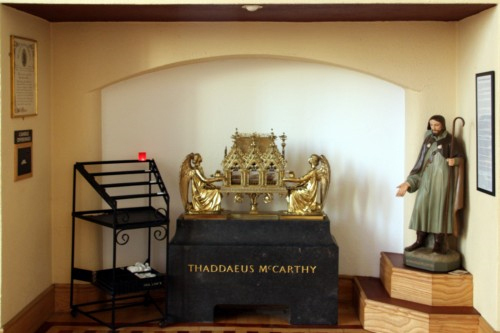 Devotion to Thaddeus McCarthy grew in Ivrea. Over the years many miracles were attributed to his intercession. When his tomb was opened in 1742, three hundred years after his death, his body was found to be completely preserved. Pope Leo XIII beatified him on 14th September 1896. Because of the patience with which he bore all the humiliations he suffered, Thaddeus is often referred to as “the white martyr of Munster”. There are relics in shrines dedicated to him in both St Colman’s Cathedral, Cobh, and in the North Cathedral of St Mary and St Anne in Cork. Youghal in the 1560s was a prosperous town – a trading town with a good harbour for fishermen and for cross-channel commerce. Dominic’s father and brother both served as mayors of the town. What was a young man of twenty to do with his life if the prospects at home were poor? He thought of a military career and so, set sail for France, landing south of Brittany. He had good health, was well-built and had ambition. He felt he was officer material but if he was to join the cavalry he needed a horse. He decided to go to work in an inn in order to raise the money. Over some three years he earned enough money to buy his way into the army of the Duke of Mercoeur which was fighting on the side of the Catholic League. Dominic rose in the ranks to become captain. He went on to become governor of an area near Lapena in Brittany and when, after nine years of military service, he decided to leave the army, he was granted a pension of twenty five crowns a month by King Philip II of Spain. This Spanish connection brought him to the naval base at Coruna in north-west Spain which had strong ties with Ireland. What was he to do now? 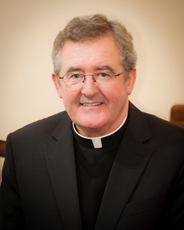 He happened to meet a Jesuit – Father Thomas White – a native of Clonmel who had come from Santiago to hear the confessions of Irish soldiers in the fleet during Lent of 1598. Dominic spoke to him about the next stage in his life. The two men talked and Dominic expressed a desire to become a Jesuit. But given his lack of formal education he became a Jesuit brother rather than priest did not disturb him. 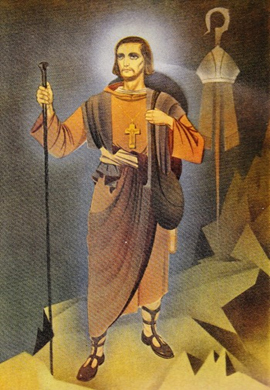 Eventually he was told to come to the Jesuit College in Santiago. His vocation was to be tested. Would he suit the Jesuits and would the Jesuits suit him? Providentially a plague which struck seven members of the Jesuit community served as an occasion for Dominic to prove his mettle. Others fled the danger but he stayed and served the sick for two months. He had come through the test and was admitted to the novitiate. 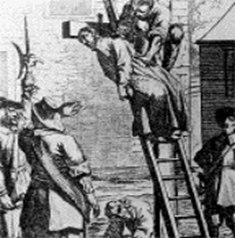 Brought back to his native town he was hanged on 31 October 1601. 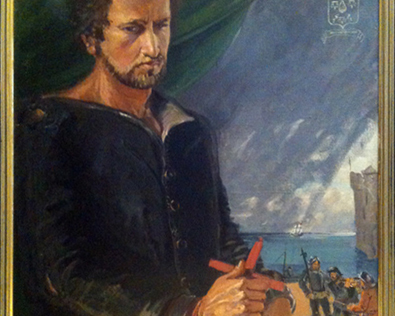 A request came from another Irish Jesuit, Father James Archer, that Dominic should accompany the Spanish fleet being sent by the new King of Spain, Philip III, to the help of Hugh O’Neill and Red Hugh O’Donnell in their attempt at revolution. His superiors agreed to the request and so, at the age of thirty-five, Dominic was to return home to Ireland not as a soldier but as a religious who knew the needs of soldiers. The fleet set sail on 3 September 1601 in two squadrons. Dominic, as a religious, helped the many wounded and dying. Upon capture, Carew felt that if he could get Dominic to change his religious allegiance, this would be a great propaganda victory. For over three months Dominic was tortured and promised preferment if he yielded. But he was a man of resolve. He had given his word to God in his vow ceremony that he would be faithful to his promise. His interrogation took place in Cork but his place of execution – for that was his fate – was to be his home town of Youghal. On 31 October 1602 he was marched through the town to the place of execution. No doubt many onlookers were eager to see their fellow townsman again after some fifteen years. Dominic addressed the crowd in a mixture of Spanish, Irish and English, telling them the reason for his execution. Such were the effects of his words that the hangman refused to do his work and the soldiers had to get a fisherman whom they seized, to do the job. Dominic’s final words were ‘Into your hands I commend my spirit’. In the words of Hopkins: ‘Thee, God, I come from, to thee go’.